Lovely quilt ordered with two others for our country place. Vivid egg yellows, olive greens, bright white, chocolate and black make for a fantastic quilt presentation for sure. We recommend for those wanting an updated country feel. Quilt is nicely presented and thick. With a warm harvest-style pattern and exciting non-uniform patchwork design, this gorgeous three-piece quilt set is the perfect complement to any farmhouse or cabin style home. 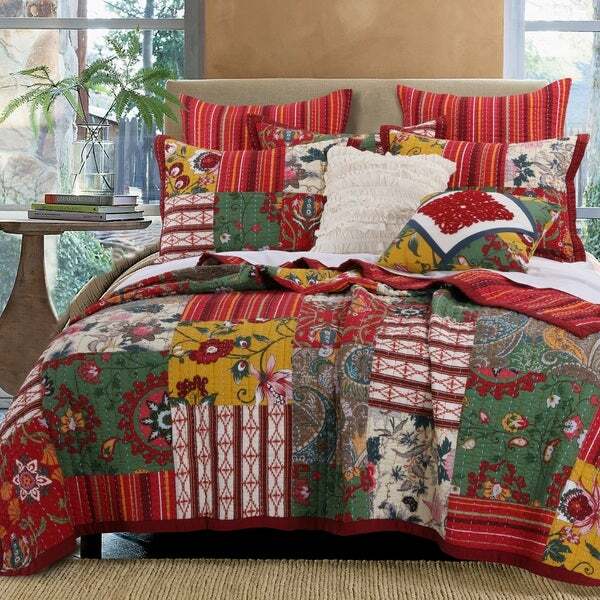 Rich reds, yellows, and greens mix beautifully with floral and paisley images for a truly unique bedspread that's just as warm as it is stylish. With a striped back and kantha embroidery, the impeccable character and floral charm of this delightful quilt and sham set is sure to transform your space. Item was not of the quality I was looking for and they also had it miss marked, I ordered King size and they sent Queen size with a sticker that had the item in there inventory marked as a King size. regardless because of the quality I would have returned the quilt.